After playing a few games of StarCraft 2 beta, I find it bears more overall resemblance not to the original StarCraft, but to WarCraft III. That is, the game feels more like “WarCraft III Sped Up” than “StarCraft with Better Graphics.” And this is by no means a bad thing—StarCraft 2 is much better right now than either StarCraft or WarCraft III. This demonstrates the earlier point: The SC2 Mutalisk looks far more like the WC3 Gargoyle than the original Mutalisk—the merit of three dimensions is enough. Okay, enough with graphics. Blizzard games aren’t known because of their graphics—they are known because of their gameplay. And here, SC2 bears another resemblance to WC3. A bunch of other factors aside, the key difference between SC and WC3 gameplay is that SC is more intensive on macro and WC3 is more intensive on micro. Macro is the control of numerous units, structures, upgrades, attacks, and resources in numerous places, while micro is the control of a small number of units but as efficiently as possible. In SC, most units cost 1, 2, or 3 supply, and the supply cap for each player is 200. In WC3, most units cost 2, 3, or 4 supply (heroes—5), and the cap is 100. In reality it’s lower than that, because an income tax for unit upkeep is incurred at 50 supply, and a still heavier one at 80. The point is that a player can easily have over 50 combat units at a time in SC, whereas an army of 9-18 units is normally enough in WC3. But in SC, most units rely on brute attacks, while almost each WC3 unit has at least one special ability (and heroes have multiple special abilities, not to mention items). That’s not to say that SC doesn’t have micro or that WC3 doesn’t have macro, but that is the general case. Zealot: Original has no special abilities, other than a speed upgrade. In SC2, it has Charge, which, although autocasted, must be used intently, and requires more micro than a purely passive skill. Dragoon: Original has no special abilities. It has split into two units: Stalkers and Immortals. The Stalker has Blink, a teleport which is extremely micro-intensive, and the Immortal has a hardened shield that at least requires a lot of attention. Sentry: Not in original. Has several useful active abilities. That is not to mention the overall gameplay shift towards micro. A base unit with rally point on a mineral or gas field will now tell the worker to actually mine (as in WC3), rather than just sit there, so it is not necessary for you to scroll back to base and tell worker units to mine. You can also issue multiple commands in sequence (as in WC3), so you could tell a Probe to warp in two Pylons and then return to gather minerals; this would take a few hotkeys, a few clicks, and before the first Pylon even starts, you can set your focus to other units. You can also select multiple buildings (as in WC3), so it isn’t necessary to hotkey different production buildings. Perhaps I’m ranting here, but I want to correct the notion shared by many SC players that SC is still the definitive game in the RTS genre. Sorry, its multiplayer balance is bloody good, but just about everything else is outdated. Just look at the things I talked about in the last two paragraphs—SC needs a revamp. And SC2 does a mighty fine job of that. Even on my first play, the SC2 gameplay experience was perfect. Blizzard masterfully combined SC and WC3, and made it into a far better game. All the outdated user interface stuff from SC was removed, as were all the cumbersome gameplay complexities in WC3. Basically, they took the best of both worlds (or universes, as the case may be) and brought them together into the next definitive RTS. Plus, they have two expansions in store—two more opportunities for perfection. I do have one concern, and it has to do with balance between the races: not in terms of power, but in terms of capability. 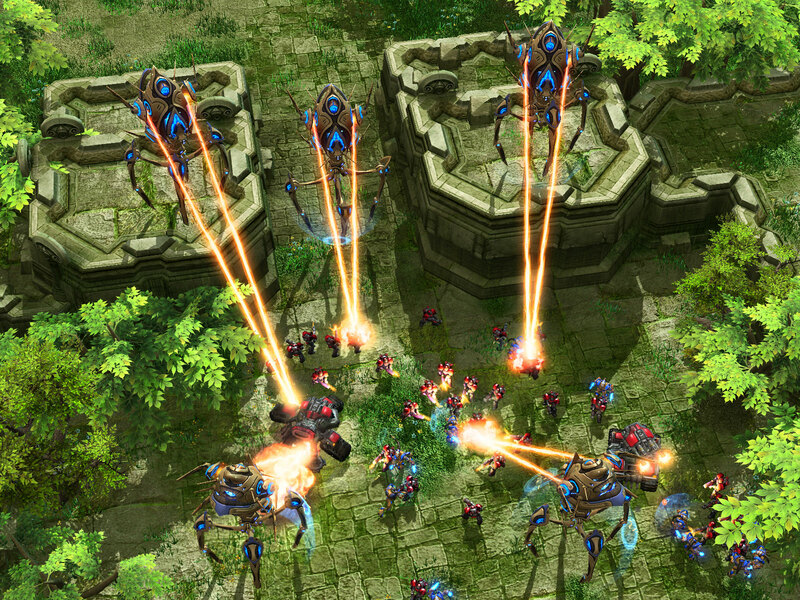 If we just look at new gameplay features, the Protoss seem to out-specialize the Terrans and the Zerg. Most Protoss units have some sort of innovative ability that did not exist before, and as a WC3 player, I was especially pleased in that, for the most part, there were no copied WC3 abilities. The most impressive ability actually was not of a combat unit, but of a building: the Warp Gate. The ability to warp units directly to the battlefield is an ingenious idea—major props to whoever thought of that. Besides that, I thought the Immortal’s shields were extremely unique, and the Colossus’ cliff-walking, laser sweeping attack, and susceptibility to anti-air attacks made it a very special unit. The Void Ray’s accelerating damage via prism focusing was also extraordinary. The Mothership looked amazing and gave the Protoss a very personal feel. Terran and Zerg, however, felt like the same races in the original SC, the Terrans more so. What special gameplay capabilities did they gain? Almost nothing. And I’m not talking about things like the Reactor Core—all this does is increase the rate of production, or modify a stat rather than add something new. Protoss gained a lot of new moves. Terran seemed for the most part the same. The Command Center’s upgrading is quite cool. Vikings, the transformers, were pretty cool, but didn’t make much sense. If they could attack the air from the air, why couldn’t they attack air from ground (or ground from air)? Banshees seem about as useful as Valkyries, considering that Terrans have so many anti-ground attacks already. I’m fine with the removal of the Goliath, but not with the removal of effective ground-based anti-air. Now Terrans will have to use Vikings and Battlecruisers to defend the skies. If anything, it seems that the Terrans lost their personality after the removal of the super-fast Vulture and its Spider Mines. In the original, if you had to point out one thing the Terrans had that the other races could not easily counter, it would be the Vulture. And again, it’s fine if a unit is removed, but something awesome better replace it. And the Hellion is currently lacking in awesomeness. Other new things, like Reaper cliff-jumping and Supply Depot submerging, don’t really add that much power to the Terrans. I think the Raven is probably the best thing the Terrans gained. What solution to the Terrans would I propose? Simple. Make the current units more awesome. Buffing their stats isn’t a good idea—adding cool abilities is much better. And definitely include a good ground-to-air unit. So, what about Zerg? They gained enough new abilities to be interesting, but not as much as the Protoss. The new role of the Queen is very appealing, as are the concepts of the Baneling, Roach, Corruptor, and Nydus Worm. These are the units that evoked a feeling of awe upon first sight. Not as awesome as the Protoss new capabilities, but enough to make it significantly improved from the Zerg in the original SC. I’m really looking forward to the map editor. There is a major point I must make here: The SC2 map editor will be able to do anything. Really? Yes. Again I was appalled when SC players and map makers posted numerous questions asking whether the SC2 editor will have certain features; Blizzard just said yes, yes, yes. In one of their FAQs, they had the question along the lines of, “Will the editor be able to—,” with the answer, “Yes.” The reason the questions were appalling was because nearly every single feature requested was already in the WC3 map editor, released five years prior to the announcement of SC2. Most SC map makers who haven’t touched a better editor will think the SC editor is extremely powerful (and it is), but the WC3 editor makes the SC editor look like an abandoned baby. The WC3 editor can already do anything. True, it’s clumsy in some areas, but its functionality is unsurpassed in the field. And SC2 is just going to be a better version of the WC3 editor—it will do anything, and even more. Doubters of the game need not worry; StarCraft II will work. Blizzard has again created a masterpiece. Edit: After further beta testing, I wrote an addendum to this post, mostly about Terran. Edit 2: As of beta patch 9, the map editor is out! Here’s my blurb on the StarCraft II Map Editor. You go into a lot of detail. I dont know how you manage all of the time Sean :). But seriously, I got linked to this article from the front page of a Google search for “protoss”, albeit I was logged in on my account (and Google knows I know you) that was still really cool. Dang….you really know alot about this stuff lol.. They always do. I can’t think of a single bad game Blizzard has released. It seems to coincide with my not being able to think of a single game they’ve ever released on anything near the originally announced release date.